a) What is the x-intercept? b) What is the y-intercept? a) On what interval(s) is the function increasing? b) On what interval(s) is the function decreasing? c) Which choice is a relative maximum point for this function? a) On what interval(s) is the function positive? b) On what interval(s) is the function negative? a) Which of the following points is a relative maximum for this function? b) Which choice describes the end behavior as x approaches infinity? c) What is the absolute minimum value reached by this function? d) What type of symmetry, if any, does this function possess? 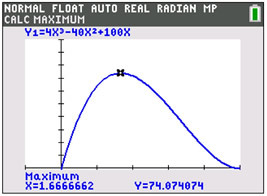 a) What is the maximum value reached by this function? b) What is the minimum value reached by this function? c) Which interval choice is the domain of this function? d) Which interval choice is the range of this function? e) If this function is referred to as f (x), which choice is f (-1)? A 10 inch square sheet of construction paper is given to each student in math class. Directions are given to fold an open-topped box after cutting congruent squares from each corner of the paper. Which equation represents the volume of the box? a) What is the maximum volume of the box, to the nearest tenth? b) To achieve the maximum volume, what size squares should be cut from each corner of the paper, to nearest tenth? The Weather Channel charted local temperatures and saw a storm front arrive at 11 AM. a) What was the maximum temperature reached during the 10 hours of recordings? b) What was the minimum temperature, caused by the storm front? c) At what time did the minimum temperature, caused by the storm front, occur? 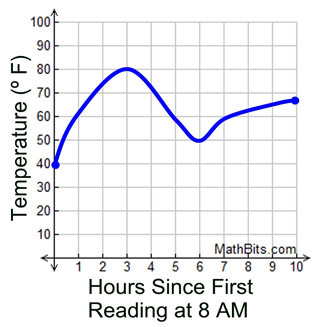 d) During what time interval was the temperature decreasing?